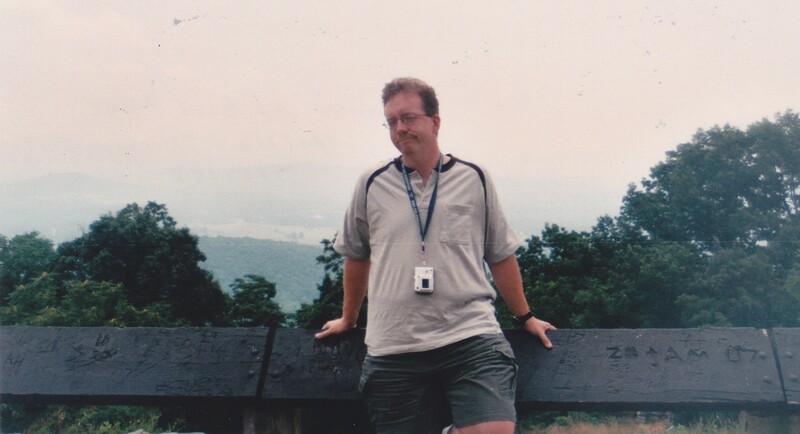 Our 2008 Road Trip, Part 4: An Appalachian Trail But for Non-Hikers « Midlife Crisis Crossover! 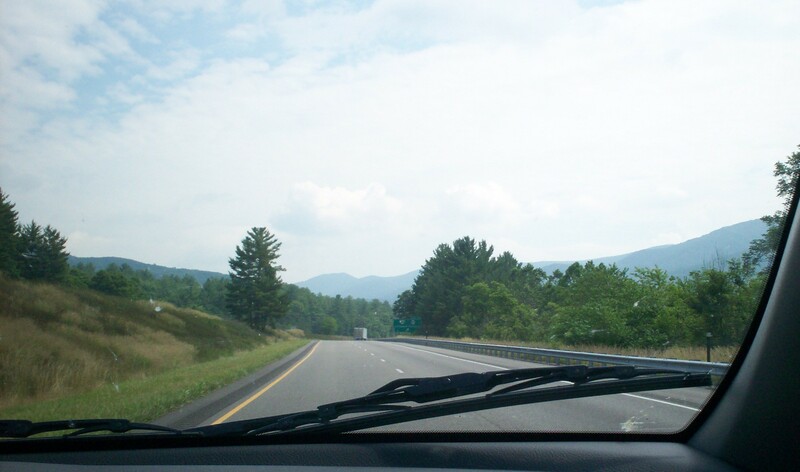 The open road to adventure! And eventually the beach. But first, our hotel. Gentle reminder to ourselves: the stereotypical mountains with sharp, iced pears are on the other, farther side of the Mississippi, not this one. 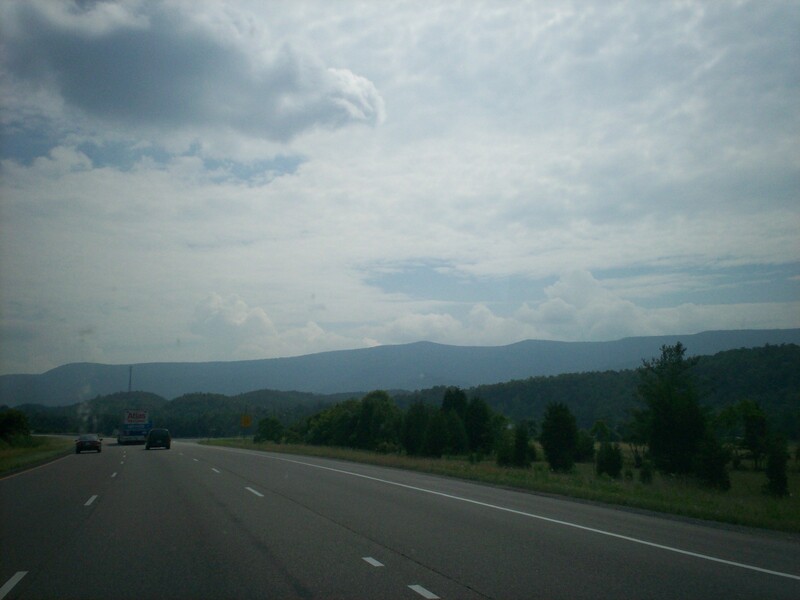 The father away the mountains were, the bluer they got. Natural optical illusions are fun. 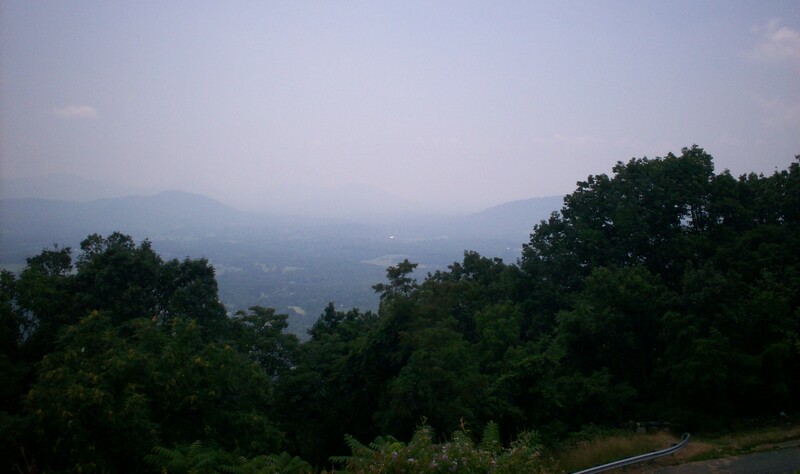 We took no photos of the storm that dogged us on the way out of Charlottesville. Most of these shots were definitely before that. Not quite New Zealand, but trying. Slightly closer, but still not New Zealand. 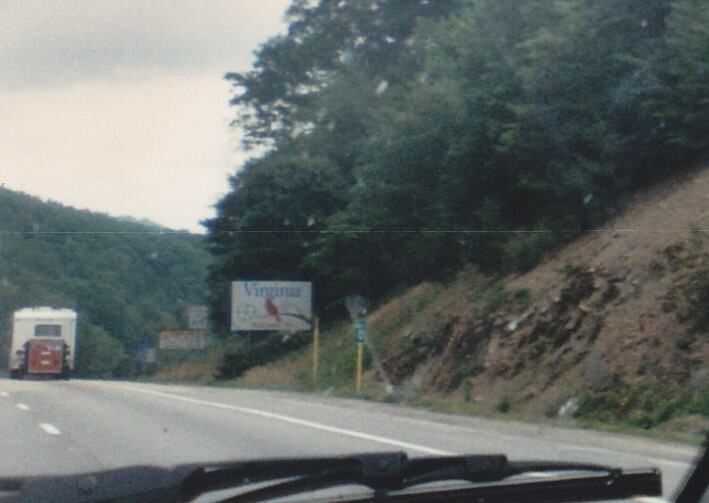 The “Welcome to Virginia” sign that nearly escaped us. I’ve gotten better about braking for these in recent years. 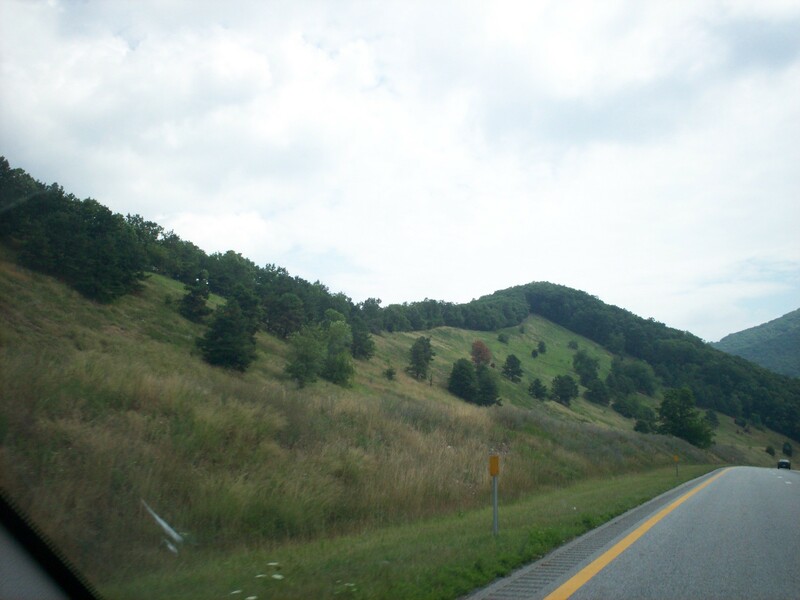 I-64 exited West Virginia and entered Directionless Virginia, where for some reason the trees seemed to be closer to the road and blocking our view of nature’s beauty. 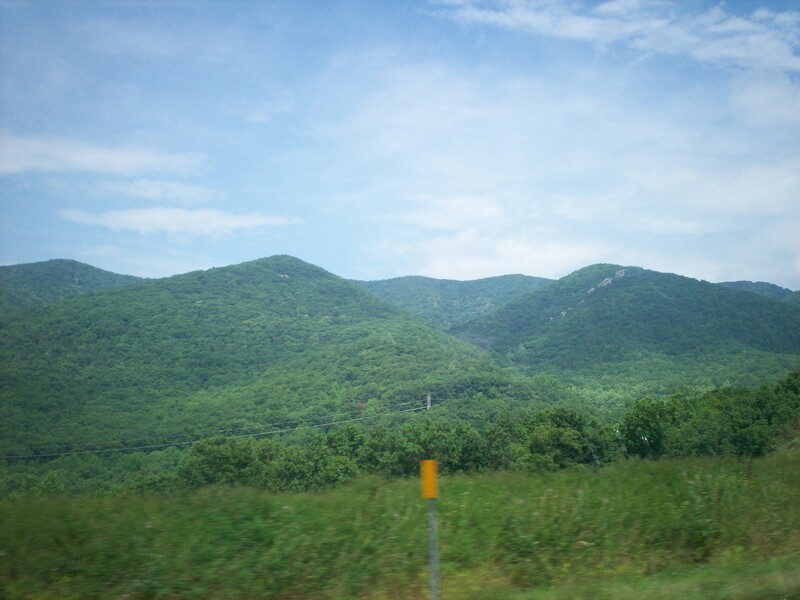 It wasn’t so bad at first while we were still in the Appalachians and only a stone’s throw from the Blue Ridge Mountains. 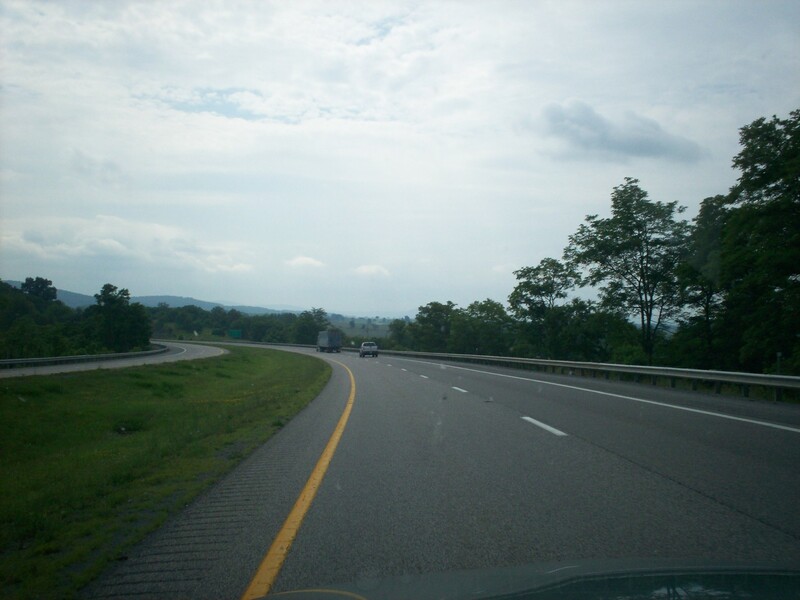 The further east we drove, the more it seemed that Virginia was practically using trees as noise barriers, I guess to prevent travelers from tainting their everyday ambience. I wasn’t conscious of it for the first few hundred miles — it only occurred to me when we drove through the capital city of Richmond later in the day and I realized hours after that that Richmond hadn’t made a single visual impression upon me. Dramatic reenactment of every single mile of I-64 through Richmond. Population: probably. After our detour for Monticello in Charlottesville, our accommodations for the next four nights were southeast in Hampton, located almost centrally equidistant from the other, far more interesting cities of Jamestown, Williamsburg, Virginia Beach, Norfolk, Chesapeake, Yorktown, and more. We pulled off the interstate and into the parking lot in front of the Holiday Inn sign. Our usual arrival procedure is that we each grab as much luggage as we can carry without toppling over. We rarely bother waiting for bellhops or searching for luggage carts. I prefer to get the more painful chores out of the way as soon as possible, so I grabbed our overstocked cooler first. It was on the floor, wedged between the driver’s seat and the back seat. It took a few stern, impatient yanks to dislodge it, at an awkward angle that did my back no favors. When we entered the nearest door or the nearest building, imagine our faces, if you will, as we yearned for our place to rest for the day at last, only to be told by the helpful clerk that we’d walked into a Quality Inn. The Holiday Inn was on the other side of the sign, not to mention set back several hundred extra feet from the road. The polite strain in his voice implied this was an everyday annoyance for him. We exited minus dignity and walked the first few hundred feet toward the Holiday Inn until our fatigue began to match our embarrassment level. I happily slammed the cooler down, and they dropped their armloads. I fetched the SUV, reloaded passengers and cargo, and motored the rest of the way to the front door, which was naturally on the far side of the building. Navigating the Inn itself was almost as confusing. The place was a combination hotel/motel, with rooms both inside and out, all orbiting an enormous atrium that held their fancy restaurant/bar plus an indoor pool. It also had an outdoor pool on one side, a small convention center on the street-facing side (which is why we didn’t initially recognize the place), and another two-story motel addition across the back parking lot. We had to enter from the west, check in at the front desk located toward the south end, then detour east into the atrium, shortcut north through the restaurant, turn east after their computer center, divert north through a dingy ice machine hallway, exit the building, and then head due east to reach our motel room. I’ll understand if you got lost somewhere in the middle of this paragraph and would rather I just inserted one of those old Family Circus panels where Jeffy makes eighteen stops on his way to take out the trash. Even with a map of the complex in hand, finding our room took more than one try. If it weren’t for us guys and the mapping skills that video games taught us, we’d probably still be wandering the Holiday Inn corridors today, haunting the other guests and trying to axe-murder the groundskeeper. We unloaded all our luggage from the SUV for the second and final time that day, including that Godforsaken cooler. I made a mental note to consume as many of our drinks as I could over the next four days without inducing water poisoning. (My son’s Gatorades were safe from my vow, though. Even when I’m disregarding diet maintenance, sugary fruit drinks and soft drinks still hold no appeal for me anymore.) After resting for a few, and after disapproving the prices on the hotel menu, we saddled up once more and sallied forth to find a viable dinner spot. Several long minutes of pointless searching later, I gave up and pulled into a rundown Pizza Hut that would’ve looked right at home in No Country for Old Men. I was tired of driving, and I knew Virginia would provide other culinary opportunities in the days ahead, so I showed mercy to my son and the comfort-food addiction so typical of his demographic. We grabbed a table and sat ungreeted for at least fifteen minutes until a waitress apparently ran out of better things to do and acknowledged our presence. Crowds weren’t to blame — the place was mostly empty. We tried not to take out our frustrations on each other, and eventually our patience was rewarded with customer service and company-standard pizza. I was all too spitefully happy to write off her below-par tip as moral collateral damage. We stopped for gas on the way back. On my way in to pay, another customer asked me if I knew where to find the Red Roof Inn. If only Leonard Nimoy’s In Search Of… had ever turned its attention to the subject of Hampton hotels, perhaps travelers like us wouldn’t have this shared problem. At the end of the overlong day in our hotel room, I couldn’t wait to hit the bed. Sadly, and yet apropos of our Hampton experience so far, I found it one of the lumpiest beds ever. I kept awakening periodically throughout the night, as if the bed were hitting me back.